Sophie Shevardnadze:Eeben Barlow, founder of Executive Outcomes private military company, welcome to the show. It’s really great to have you with us. Now, Mr. Barlow, Executive Outcomes and other firms you were involved in have conducted a lot of highly successful operations getting more than one government out of a scrap. Why is it that your PMC came under political and media pressure every time they achieved progress somewhere? I mean, what is wrong with Boko Haram or the Revolutionary United Front or Lord Resistance Army being defeated? Eeben Barlow: I think it’s very hard for me to sometimes comment on that. I think you have to bear in mind that it’s mainly the Africans that come under pressure internationally when we get involved to resolve problems; because it appears the mantra that African solutions for African problems is a very good soundbite in theory, but in practice we’re not allowed to practice it. SS:So, as you have put it, when your military company Executive Outcomes was operating the media was highly critical of it, calling it illegal or claiming its soldiers eat people. You said that EO lost the media war, but most of your operations were conducted in secret. Why was the media war so damaging for you? 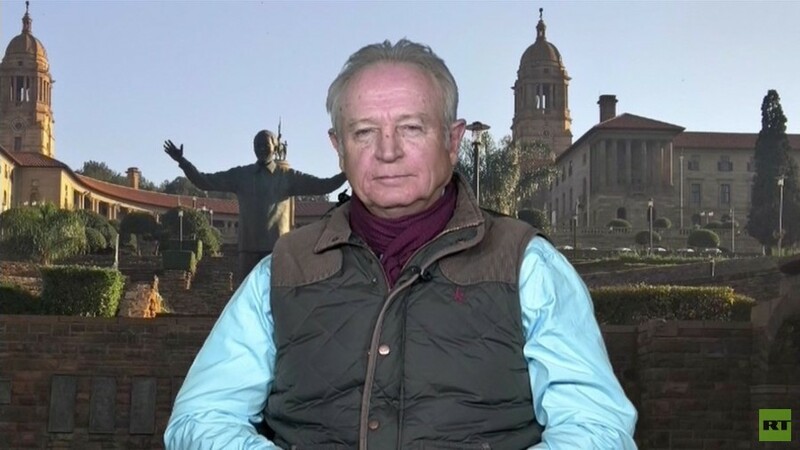 EB: First of all, the media at that time in particular was used by the South African government and the South African intelligence services to create certain perceptions. Those perceptions were very necessary in order to hide what they were actually doing, and that was supporting the so-called rebel forces in various places in Africa. And of course, our entry into those conflict zones that had huge impact not only on economic interests but also on very personal interests. And the media really just became a useful idiot as far as they were concerned. However it did create major problems for us. Yes, we worked in secrecy, but invariably any type of operation that anyone gets involved in, eventually does end up with a media. And the media were therefore used as a tool in order to counter us and to try to create a certain impression about us which was entirely false. SS:In some cases, you said that the pressure on your clients to governments to ditch your services would come from places like the Pentagon or the United Nations, for instance. Why didn’t those organisations appreciate you solving their problems for them? EB: I’ve always been of the opinion that as soon as conflicts end, organizations such as United Nations and numerous NGOs or non-governmental organizations no longer have an active role to play. Us ending conflicts could therefore negate the roles they play in Africa. Plus, what we were doing was obviously impacting on certain very deceptive foreign interests that were being practiced on this continent. EB: Well, it had to do with the mining of diamonds, it had to do with gold, it had to do with oil. All of those natural resources are obviously high-value commodities. The world currently needs commodities, and Africa is a great place to find it. As long as there are conflict on the go, certain deals can be struck with governments in order to get hold on these resources for own use. SS:So, why would these forces prefer to conduct business with rebels rather than legitimate governments? EB: Well, obviously rebels don’t have to provide any taxation to whoever mines resources within the areas. And often the rebels are really just used as a proxy force in order to destabilize the country and replace a certain government that’s not complaint enough with the wishes of those that are outside driving these actions. SS:You worked mostly under the radar. Can you imagine a situation in which governments will hire the PMCs openly, without the fear of being compromised? Or will this always be an undercover type of trade? EB: No, it’s ironic that Western PMCs unlikely have noticed Russian PMCs operating with a blessing of their governments. In Africa, many of them are being funded by their own governments. It is however a problem as soon as we get involved in trying to resolve a conflict. And we find that hypocritical. At the end of the day, if a government chooses to make use of us, that is a prerogative of that government. Our problem however is that we have to bid for a contract and have a state fund us, where other private military companies operating on this continent are sponsored by their own governments. So, the governments really have a choice: either pay money to contract us or get the so-called assistance in support they’ve asked for free. They usually go the free route and often they are left to regret that route. SS:You know, after some mercenary leaders tried their hand at military coups like the cases in Comoros, the Seychelles, Equatorial Guinea, can you blame governments for being uneasy about working with PMCs? EB: I think, if a government has contracted a PMC directly and that PMC follows the laws of that country, and that it puts itself under the jurisdiction of those armed forces, governments have no reasons to fear PMC. In fact, every time we have worked, we are integrated with the forces where we’re training. We live with them, we share the same food as they do, we live in the same type of environment they live in. And we meet them in the field. In those instances, we are directly responsible for the men that that government has placed under our command. However, if a PMC comes in and isolates themselves at one side of a military complex and refuses to integrate with troops or comes in and it’s obvious that what they are training is totally irrelevant, I think, then the governments do have a need to be concerned as to what’s going on. But we believe, if a government buys us for a service, that’s the service we deliver. We don’t take shortcuts, and our mission is usually to end the conflict as quickly as possible, not to prolong it. SS:There’s a whole heap of private military contractors working in US wars across the Middle East. And apart from Blackwater which rebranded its way out of scandals, their work goes unnoticed. Why did you have a different experience? What is it that sets your PMC apart from those who’re working, for instance, in Afghanistan? EB: Well, first of all, we are an African company. We are stuffed by Africans, we are based in Africa, and therefore we are not necessarily viewed as an ideal choice for foreign governments to use. We’ve never worked in the Middle East, so we can’t really comment on the efficiency or lack thereof of other PMCs. Those PMCs operating in the Middle East are funded by the host governments and not by the country where they’re working in. Though it creates a bit of a dilemma, in the sense that they are regarded as people that are doing their jobs, whereas we are regarded as the bad guys in the story. I have to mention that we have yet to come across an African army trying to buy a foreign PMC or indeed foreign forces that’ve been well-trained and prepared for their mission. Our opinion is that most African armies are being set up to fail by the foreign PMCs, foreign armed forces or foreign advisers that they make use of. SS:Why is there a search in private military companies now? I mean, isn’t cheaper for a government to just recruit more people into the regular army than pay mercenaries double or triple of what a soldier makes? EB: Well, I think there’s been a search in the requirement for private military companies given the unstable international arena that we all live in. I think, as instability grows it becomes much easier to outsource certain services to private entities. I also look at the cost of maintaining a large standing army. And then, I look at Africa in particular, whereas the doctrines that are used by many African armies and the troops that are trained in those doctrines are really doctrines that are totally irrelevant to Africa. These are doctrines that were designed to fight the Germans during WWII, or, when it comes to Western type of doctrines, to fight the old Soviets in Europe. And those types of things are totally irrelevant as far as Africa is concerned. Then, of course, there is an ability of many African governments to buy their own equipment because they’re advised to do that. All of these things become money wasters. And they have a lot of equipment and manpower that are actually unable to function coherently and to defeat an armed threat against that government. SS:So, do you see this trend of hiring private military companies continuing? Can warfare be eventually privatized and outsourced to PMCs? EB: I don’t think that it will eventually be outsourced in total. I think national armies are still there to protect the integrity of the state and the territorial integrity of their countries. However, given the role that many proxy forces are currently playing in Africa, and the size of these proxy forces and the way in which they are equipped, I think, it’s a government’s prerogative to call on any help they can, if they feel they need that help to defeat these armed threats they are facing. But that’s it, I don’t think the national armies will ever cease to exist. And I think that the correct type of PMC stuffed by the correct people, who understand the culture and the type of environment they are operating in can certainly add value to the operation efficiency of any African army. SS:But if that can happen in theory, for instance, imagine, what would be the dangers? I mean, when medieval mercenaries fought wars for Italian cities they’d stall the fighting deliberately to make more money. So, if this goes on, whatever is going on today, will we have an industry with a vested interest in war? Does that mean that the use of PMCs will cause more wars in the future? EB: Well, I think all wars are really based on mostly economic interests. Secondly, I don’t think that a PMC that considers itself to be professional is going to hire itself out simply to a highest bidder. But, of course, that danger does exist, and that’s why we’ve always been of the opinion that private military companies should be regulated and that they should act in accordance to the laws of those countries where they’re operating in. I can’t see private military companies taking over the defense industry in total. But I do foresee a time when private military companies are simply going to go for the biggest bidder, and that’s because many of them are unprofessional. They are out to see how long they can actually prolong a conflict or a war because the longer that goes on, the more money they make for themselves. I don't think however, that within the type of environment that we operate, the governments are concerned of our role because they understand what we do, and we understand where they need to be going. Sadly, that seems not to be the case in many countries. SS:So, aid from the United Nations or powerful governments be in the form of special forces training or direct military involvement, always comes with conditions. Your work was offered strictly for money, nothing else. Why aren’t the governments around Africa excited about this? EB: Well, first of all, of course, we work for money. We have salaries to pay, we have families to feed, we have travel expenses, we have insurance, we have medical etc. Though we can’t do what we do for free the governments in Africa often do speak to us. In fact, we’re in regular contact with several of them. The irony about all of that is, although, they wish for our services, they’re continually threatened that if they make use of us it will be to their disadvantage. These are threats that come from beyond Africa. And it’s really just a proof to us that a stable and secure Africa appears to be in very few people’s interests. EB: Well, I can’t speak on behalf of the US, but we do know that the US doesn't like it when we operate in Africa. They have their own reasons for that. Yes, indeed you have to look at a special forces soldier, he’s not a soldier that can be used in any environment or within any sort of military context. He has a very particular role. Our view has always been to train soldiers to identify their enemy, to be able to outthink their enemy, to make use of the terrain they are in. This is very very terrain, that it can’t be a single approach to ending a conflict or war. Though we go through a huge process of analysing the type of environment we are working in, because our mission is always very clear from a government - to end the conflict as quickly as possible. And then, there is exactly what we are set out to do. So, we adapt things, we change things. We are, I like to think, very mentally flexible and agile in order to read situations and predict and preempt what’s going to be happening. SS:Neall Ellis who flew missions under your command once said that the enemy in places like Sierra Leone, for instance, was rubbish. Can the successes of PMCs like yours be attributed to the fact that the enemy is usually just very weak? EB: I think, we need to understand the mindset of these enemies. There are different types of the enemies. There are sometimes just thugs who’ve got weapons. And because of that they perceive themselves to be in position of power, and usually they are. But I think, when we come to countries like Sierra Leone and others, those armed forces have had several years of training from Western armies in particular, and their training is incredibly poor. So when you put up a fully trained army against a bunch of armed thugs, who have over time generated confidence and belief in themselves, the military usually perform dismally. In Sierra Leone, what the government was told by the foreign adviser would take six weeks to do, we accomplished in two days. And it’s not necessarily always an enemy or a threat that’s rubbish, it’s just being able to outthink and outmanoeuvre him and then to destroy him on the battlefield. EB: Well, it’s very difficult to work with the minimal means. If I can just take you back in a more recent situation where we were in Nigeria, we had two gunship helicopters that were modified. They were really secondhand helicopters, and we had one dedicated gunship. We had very few air assets. We didn’t have enough vehicles, we didn’t have enough indirect fire support such as mortars. Although everyone had small arms and there were some machine guns throughout, it then becomes a matter of being able to utilize a unique doctrine, and to rely on speed to outthink the enemy to preempt what he is going to do. But in order to achieve that, we need intelligence. So we have to focus all our efforts on gathering intelligence identifying enemy’s intentions and then actually preventing him from implementing his intentions. We’ve never been in a position where we’ve had too much equipment. In fact, I think very few national armies have too much equipment. But we have really had to work sometimes with a very minimal equipment, and that’s in terms of our means. But because of that, we’ve learned how to overcome certain obstacles in our path and really outthink and outmanoeuvre an enemy. SS:In general, how do you think wars in Africa are different from wars elsewhere? Is it more chaotic on your continent? EB: I think, wars in Africa differ vastly from other wars, although there are some similarities to them. I think, first of all, we have to look at why these wars are started. Often they are not started by armies, they are started by disgruntled or disillusioned groups of people. Those groups of people sometimes transition into a proxy force that are then supported by outside forces in terms of finance, or in terms of equipment, or in terms of training. But I also think the environment in which we operate is vastly different from elsewhere. You know, we operate from jungle type terrain to desert type terrain and everything in between as well. And then, I think we need to look at the manpower itself, whereas there is nothing wrong with the African soldier. In fact he’s a very good soldier if he is correctly trained and led. But many of these soldiers are really poorly trained. They then suffer from something that most armies suffer from in the world, that is inadequate command and control. When you combine all of those elements together, it becomes a very different type of war. We have to operate across large tracts of land with no infrastructure. We often have no air support assets. We have no way in which to rapidly move troops. There might be one or two helicopters, but those helicopters are very stretched in what they can do and what their particular missions are. In Africa we have to adapt constantly to what’s happening. And then, add to that, the type of environment and terrain we operate in. SS:You’ve said that you hire people of all races and that sometimes you worked with people that you used to fight against. How does that work inside the team? I mean, can you rely on your former enemies when things start to go wrong? EB: Well, first of all, one has to look when I made that comment - that was when Executive Outcomes was in operation. Despite everything the media proclaimed about the South African Defence Force, it was a multiracial army. So, many of our fighting men came from mainly black units, and I served in one such unit. But they were men I trusted and I worked with. We’ve had the same type of background. Insofar as the erstwhile enemy was concerned, we had many members from African National Congress's armed wing - the MK - which applied to join us. And those who had the correct profile and the correct experience and knowledge we accepted into our company. The bottom line is, we work as a company and as a team; and everyone has a part to play in that team regardless of what his political leanings might be. But we don’t go out and hire people who we’ve actually opposed on the battlefield in more recent times. Although we have members in our company that come from numerous African countries, everyone knows that when we work, we work together as a unified team. We have a unified goal to achieve on behalf of the government. But to us it’s not a problem of distrusting the people with us. We know we can trust them, we worked with them, and they know what is expected from them. SS:You believe that only Africans can solve Africa’s problems. Are you saying that if all foreign forces including UN peacekeepers withdraw from Africa, the continent will finally have peace and prosperity? EB: I firmly believe that only Africans can solve Africa’s problems. I think we need to have a look at who is driving a lot of the crime which is taking place - I am speaking of whether it be national crime, organised crime in terms of resources, resource-stripping - if that’s the main cause of many of the problems we have in Africa. I think that the UN forces are bloated, in other words, totally oversized or over-budgeted in terms of what they achieve, because their successes are not that many. Usually when we have brought about a situation within a conflict, where the enemy or the threat decides to negotiate, the first people to rush are the UN who then demand our departure. As soon as we depart their forces suddenly escalate out of control as do their budgets. I can use Sierra Leone as an example, 18 thousand men to replace what 200 men did - that’s an astronomical budget. I don’t think that is really looking at the interest of Africa. But I do think that Africa has a large amount of responsibility for the problems that it finds itself in. As if the content leaders have allowed themselves to be misadvised in many instances, this misadvice has costed them very seriously. But I do believe that many of these foreign forces in Africa are here not to solve problems but to ensure that the problems continue. Therefore, I believe that only we can solve our own problems. SS:Mr. Barlow, thank you very much for this interview. We were talking to Eeben Barlow, the founder of Executive Outcomes, private military company, author of “Executive Outcomes: Against All Odds”, talking about the truth behind the mercenary wars.